The 2017 Chevrolet Impala was recently named the “Best Large Car for the Money” by U.S. News & World Report. While this might seem like a rather specific award, it’s actually the perfect way to articulate the best attributes of the model. After all, the hulking sedan includes all of the amenities and functions that you could possibly want from this type of vehicle, including impressive performance/efficiency specs, a luxurious and innovative interior, and a host of safety functions. Best of all, the vehicle is rather affordable, making it an ideal option for a customer on a budget (although it’s admittedly pricier than the brand’s other sedans). The 2017 Impala is clearly regarded as a “large car,” and the pair of available engine offerings certainly confirms this designation. Ultimately, drivers will be hard pressed to find a similar vehicle that manages to crank out as much power as the 2017 Chevy Impala. The ECOTEC 2.5-liter four-cylinder engine is the smallest of the two offerings, but this unit still manages to deliver a whole lot of muscle. Drivers can ultimately anticipate an impressive 197 horsepower and 191 pounds-feet of torque, which should be more than enough power to overcome any type of road conditions. Plus, thanks to clever fuel-saving inclusions like Variable Valve Timing, auto start/stop technology, and a six-speed automatic transmission, drivers can anticipate a respectable 30-mile-per-gallon highway fuel efficiency. The 3.6-liter V6 engine manages to take those power specs to a whole new level, delivering an unmatched 305 horsepower and 264 pounds-feet of torque. Despite all of this power, the unit still manages to be relatively fuel efficient, as operators can anticipate a solid 28 miles per gallon while traveling on the highway. The Impala is one of the brand’s pricier sedan offerings, but those higher monthly payments are plenty justified when you see everything that the model’s interior contains. It starts with the opulent inclusions throughout the interior, like the “chrome touches” or the “wood grain accents.” These amenities are often reserved for luxury brands, and they’re usually included in significantly more expensive vehicles. Of course, another major interior attribute is technology, as the vehicle is full of innovative features that will influence both convenience and entertainment. 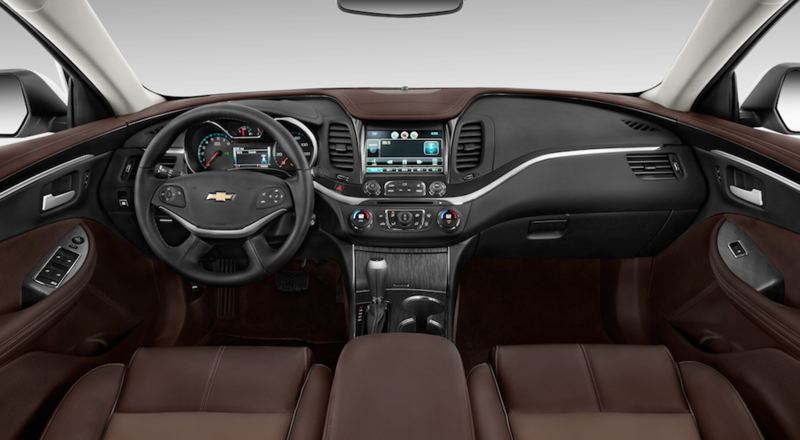 The Chevy MyLink system provides easy access to an assortment of useful applications, and the accompanying Apple CarPlay and Android Auto compatibility makes it incredibly easy to connect your smartphone (and vicariously perform many of your phone’s basic functions, like playing music, sending texts, or making phone calls). The 4G LTE Wi-Fi might be one of the most exclusive inclusions to the 2017 Chevy Impala. With the ability to connect up to seven devices, you and your occupants will consistently have access to a reliable wireless internet connection. Therefore, if you’re required to complete any work while you’re on the road, you won’t be required to hunt around for a coffee shop with free wi-fi. Finally, the last bit of notable technology isn’t even included in the actual sedan. The myChevrolet mobile application has proven to be one of the most appreciated inclusions provided by the brand. Thanks to this offering, drivers can remotely access several aspects of their vehicle, and they’ll have the ability to lock/unlock doors or start/stop their engine. Drivers can even send directions directly to their vehicle, or they can rely on the application to monitor vehicle diagnostics. The Impala is evidently a larger sedan, and that makes it a perfect choice for families. Of course, if you are going to be traveling with your younger occupants, you’ll certainly want your vehicle to be equipped with some types of safety functions. Well, that can be expected when it comes to the 2017 Impala, as the vehicle includes a number of safety features that can help prevent accidents altogether. For instance, technologies like the Forward Collision Alert will be helpful when you’re traveling in traffic, as the system will notify the driver when a crash is imminent. After altering the driver via audible and visual cues, the system can automatically apply the brakes to help avoid a crash. The Lane Departure Warning and the Side Blind Zone Alert play a similar role, alerting the driver when it might be unsafe to switch over. Finally, the Rear Cross Traffic Alert should reduce the chance of a fender bender, as the unit will notify the driver whenever an object (whether it be a car or person) are about to cross behind your Impala. There’s even a rear vision camera, which will allow you to literally see everything that’s happening behind your ride. In the event of an accident, the model includes a number of amenities that should help keep occupants safe and secure. The 10 standard air bags will provide everyone with the utmost cushion, thus preventing injuries. If you need more help, you can rely on the accompanying OnStar Automatic Crash Response System, which will vicariously lead to emergency personnel immediately traveling to your crash site. All of these inclusions likely played a significant role in the vehicle earning a five-star overall vehicle score from the National Highway Traffic Safety Administration. So the 2017 Chevy Impala is clearly an ideal choice for any type of driver. Well, now that your impending target has been determined, it’s time to start shopping! Fortunately, if you live in the Albany, New York area, you won’t have to look very far. That’s because DePaula Chevrolet is currently stocked with all of the brand’s most popular models, including the Impala. Their helpful team can guide you through the entire ordeal. Before you know it, you’ll be signing your papers and driving off the lot in your new car!